Miami Book Fair International has again partnered with Diamond Book Distributors to present comprehensive programs on graphic novels and the comics world that will celebrate their historical place in our country’s literary life, as well as their recent rise in popularity, and integration into the mainstream via bookstores, libraries and educational curricula all over the country. The Comix Galaxy is expanding! Programs include New York City-favorite Kids’ Comic Con; an artists’ alley where comics creators from all over the country will draw and sell artwork; two shows of original comics and graphic novel art; and more than 35 comics and graphic novel artists, writers and other industry professionals! With the participation of experts in the field of education, The School of Comics is in session again this year. The bell rings promptly at 10 a.m. on Friday, November 13. The day-long program includes six educational sessions for teachers, librarians, parents and others who want to learn more about the format. This year for the first time, The School of Comics presents a session especially for creators! For complete information click here. On Saturday and Sunday, November 14 and 15, fan-favorite graphic novel and comics creators, will participate in panel discussions and present new works. Highlights panel discussions on the life and art of the legendary cartoonist and creator of MAD Magazine, Harvey Kurtzman, and on the biggest news to rock the comics world in 2009—Archie and Veronica are tying the knot! For a full program schedule, click here. This year the Comix Galaxy boasts TWO exhibits of original comics art. The Photographer, featuring photos and illustrations from the graphic novel documenting Doctors Without Borders’ clandestine cross-border operation to assist Afghans after the Soviet invasion in 1979, and The Color of Comics, a look at images of people of color in comics and graphic novels. For complete information click here. And new this year, all the way from New York City, it’s Kids’ Comic Con! During the three day Street Fair, Friday-Sunday, Nov. 13-15, the road show version of Kids Comic Con offers back-to-back comics-making activities for kids and teens taught by renowned artists visiting from all over the U.S. From drawing workshops to portfolio reviews, Kids Comic Con is the place for every kid who dreams of creating the next Superman or Wimpy Kid. For a full program schedule, click here. 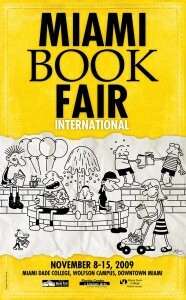 Plus graphic novel publishers, exhibitors and retailers on the Street! Anyabwile, Dawud, Brotherman * Bliss, Harry, Luke on the Loose (TOON Books) *Briant, Ed, Don’t Look Now * Chaison, Nicole, The Passion of the Hausfrau (Villard) *Craft, Jerry, Mamas Boyz * Clavijo, Sergio, Big Fly Creative Works * Drozd, Jerzy, The Front Dysart, Joshua, Unknown Soldier (Vertigo/DC Comics) * Felix, Ray, Runaway Slave * Fies, Brian, Whatever Happened to the World of Tomorrow? (Abrams) * Goldman, Dan, 08: A Graphic Diary of the Campaign Trail (Three Rivers Press) * Gownley, Jimmy, Amelia Rules (Simon & Schuster) * Hassler, Kurt, Publishing Director, Yen Press * Hamilton, Tim, Fahrenheit 451, (Hill and Wang) * Hayes, Geoffrey, Benny and Penny in the Big No-No! (TOON Books) * Jacobson, Sid, Vlad the Impaler: The Man Who Was Dracula (Hudson Street Press) and Che: A Graphic Biography (Hill and Wang) * Kleid, Neil, The Big Kahn (NBM Publishing) * Kuumba I, Mshindo, artist for Ania, Defiant, DC Comics * Marchetto, Marisa, Cancer Vixen (Pantheon) * Mariano, Mark, Happyloo and O-Matics in Comic Mishkin, Dan, editor/publisher, Sugary Serials * Monnin, Katie Dr., Teaching Graphic Novels: Practical Strategies for the Secondary ELA Classroom (Maupin House) * Morishima, Janna, Director of Diamond Kids Group at Diamond Book Distributors * Nash, Eric, Manga Kamishibai: The Art of Japanese Paper Theater (Abrams) * Neufeld, Josh, A.D. After the Deluge (Pantheon) * O’Brien, Anne Sibley, The Legend of Hong Kil Dong * Pitchetsote, Pornsak, Unknown Soldier (Vertigo/DC Comics) * Ruiz, Fernando, Archie Comics * Salicrup, Jim, publisher, Papercutz Co. * Sandell, Laurie, The Impostor’s Daughter (Little, Brown and Company) * Sikoryak, R., Masterpiece Comics (Drawn & Quarterly) * Simmons, Alex, Founder, Kids Comic Con, and Curator, Color of Comics exhibition * Small, David, Stitches (W.W. Norton and Co.)* Sturm, James, Adventures in Cartooning (First Second Press) and * James Sturm’s America: God, Gold, and Golems (Drawn & Quarterly) * Tyler, Carol, You’ll Never Know (Fantagraphics) * Van Peebles, Melvin, Confessions of a Ex-Doofus-Itchy-Footed Mutha (Akashic Books)* Weil, Bob, Vice President and Executive Editor, W.W. Norton and Co.